Made with high quality Hypodermic needles - ensures smooth flow of cryogenic gas and lasts longer. 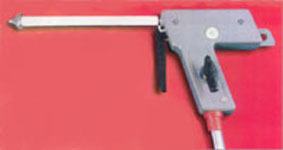 Equipped with specially designed 'Silencer' - enables quieter operation. Body made of ABS Plastic, in attractive colors - aesthetically appealing. 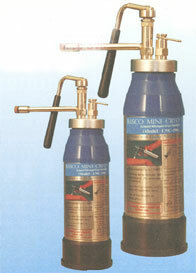 BASCO make Mini Cryo Gun for everyday simplified cryo surgery at affordable price. Common skin lesions usually required treatments that are lengthy, painful and demanded post-operative care. BASCO has introduced Cryos for Ophthalmic, a totally non-electric Cryo Console Unit. The absence of electric connections ensures safe handling.Cryo is functionally designed to simplify Cataract, Retinal, and Glaucoma procedures by use of a variety of surgical probes. 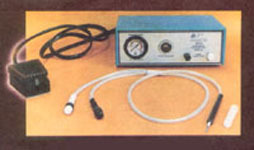 Carbon-DI-oxide gas is used for Insufflator/Laproscopy instruments. 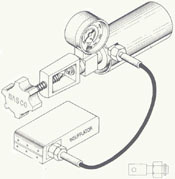 A small CO2 cylinder (imported) weighing about one or two kilogram(s) with pin index typeor bull nose type is supplied along with the unit. Cryo is functionally designed to simplify catarat, retinal and glaucoma procedures by use of a varietyof surgical probes. The BASCO Cryo is foot operated and very sleek enabling easy handling and the pedal control enables instant freezing and defrosting. 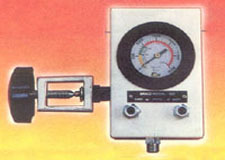 The console face includes a pressure indicator and ON-OFF reading for visual indication of the system. The Foot Operated Cryo is a very popular product of BASCO. 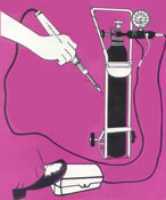 It can be used for Opthalmic i.e, cataract, retina and glaucoma by changing the probe tubing set to opthalmic probe since the basic instrument is same for Dermatology and Opthalmy.This type of works with Nitrous Oxide(N2O) and carbon-DI-oxide(CO2) gas. 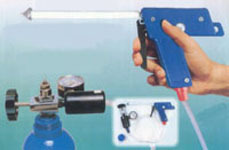 To use with CO2, a CO2 adaptor is necessary.